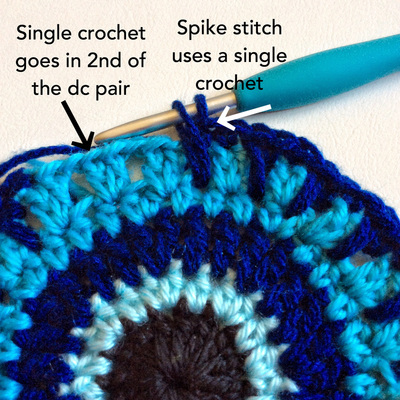 Spike stitch - work into the corresponding stitch in the row below the next stitch. 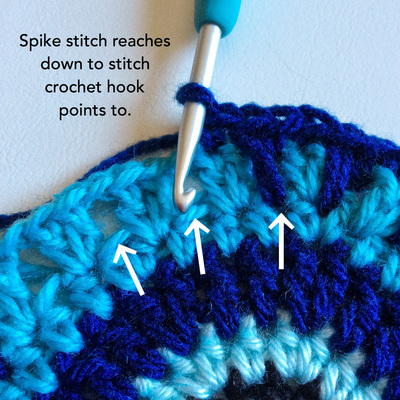 Don't worry if your corresponding stitch isn't directly below the stitch you'd ordinarily be working into. It might be a little to one side; that's normal. I used 5 different colours of 8ply DK with a 4.5mm hook. Any yarn with an appropriate hook size should work. You can start with a magic ring if you prefer. Weave the ends in very well. I find them less reliable in yarnbombs than the chains-to-make-a-ring start. Using colour 1, ch 4, ss into first ch to make a ring. Continue on with same colour. Ch 3, work 15 dc into the ring. Work between stitches in this round. Attach new colour any where with a ss. Ch 2, work a hdc in same st, work 1 hdc in next st.
* Work 2 hdc in next, 1 hdc in next st. * Repeat from *to* around. Ss into the top of the first ch. Attach New colour any where with a ss. Ch 3, work 1 dc in same space. Work 1 dc in next two sts. * Work 2 dc in next st, then 1 dc in the next 2 sts. * Repeat from * to * around. Ss into the first ch. Ch 2, work 1 hdc in same space. Work 1 hdc in next 3 sts. * Work 2 hdc in next st, then work 1 hdc in the next 3 sts. * Repeat from * to * around. Do not change colour, but continue une onto round 5. Ch 3, work 1 dc in same space, ch 1, skip 1. * Work 2dc in next st, ch 1, sk 1. * Repeat from * to * around. Attach new colour in the top of the 2nd dc of any 2 dc pair. For best result use same yarn as round 3. Keep tension even and not too tight. ​Sc in the same sp. * In next st between pairs of 2dc, work sc, then work 1 sc spike stitch into the gap below. Sc in 2nd dc of the 2dc pair * . * Continue from * to * around. Ss into the top of your first sc of the round but do not finish off. Continue to next round. Ch 1. Sc into the top of each st. Ss into first sc. Finish off, weave in ends. ﻿If you enjoyed this or any other of my free patterns, I would be vert grateful if you donated the price of a cup of coffee or a ball of yarn to keep my self-funded yarnbombing and patterns going.